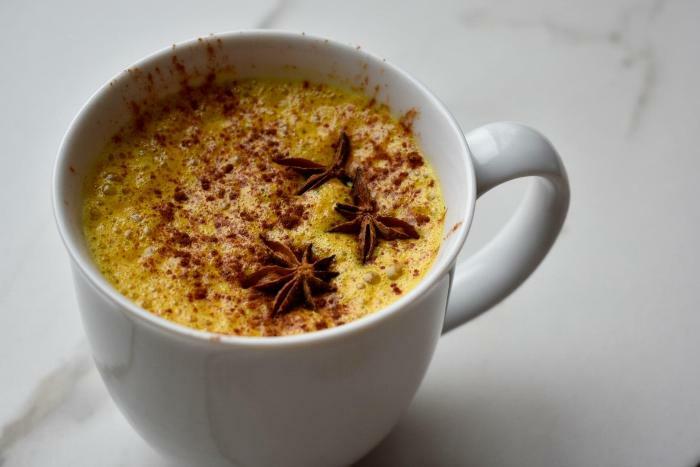 Golden milk is a healing beverage that uses turmeric to give it it's rich golden yellow color. Turmeric is known to be an anti-inflammatory agent and should be eaten by anyone who has a concern with inflammation. I've also added MCT oil to this drink as a way to get more nutritious fats into my diet. This addition doesn't change the taste of the drink so it's completely optional! 1Pour almond milk directly into the mug you'll be drinking from (we'll use this to measure the amount of milk you need) I used a medium sized mug. Once the almond milk is measured, pour directly into a saucepan to heat and to add the remaining ingredients. 2Add the remaining ingredients (except the anise pods) and heat over medium-low heat, whisking the entire time. You can also use a frother. 3Once the mixture is heated through, remove from heat and pour into your original mug. Top with the anise pods and additional cinnamon, if desired. If you still need more sweetener, you can add a few drops of liquid stevia.